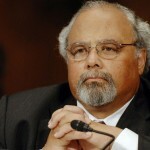 Amid growing public criticism of federal funding for antigay violence in Africa, Eric Goosby — chief coordinator for the President’ Emergency Plan for AIDS Relief (PEPFAR) — has finally spoken out regarding U.S. taxpayers’ support for the pogrom in Uganda. The Anti-Homosexuality Bill would criminalize key aspects of comprehensive HIV/AIDS prevention education and imprison health-care workers who refuse to report sexually active gay patients to the police. Goosby’s use of federal funds to subsidize the punishment of HIV/AIDS education and health-care workers, and to push LGBT Ugandans deep underground, is inexcusable. And the silence of U.S. Secretary of State Hillary Clinton, regarding her subordinates’ support for violence in Uganda, is unacceptable. Please write letters to Clinton demanding a hold on all PEPFAR funding until strict human-rights, patient-confidentiality, and free-speech controls are imposed upon all PEPFAR aid. PEPFAR aid must not be given to sectarian religious interests, especially those with violent and inhumane intentions.